JOHN JAMES AUDUBON. Print. Swamp Sparrow, . 11½ x 15½ in. framed. In 1858, the U.S. Government ordered 200 sets, which were given to foreign governments as a thank you for important gifts given to America. Total number of color plates in the octavo editions: 500. Printing method: Black and white lithography, watercolored by hand. The process was also called planeography. Lithographer: John T. Bowen, Philadelphia. Unlike the elephant folio editions, Audubon included texts in these smaller editions, similar to the textual content of his earlier Ornithological Biography reference work. By this time, however he had produced more research and had added new species (500 bird plates, rather than only 435 for his “elephant” folio). The octavo editions are not an exact replica of the elephant folio plates. While more than one species is shown on some of the plates in the elephant edition, only one species appears on each plate in the octavo editions. Often, the backgrounds were simplified. As well, new species of birds and new plants appeared in the octavo editions, and the birds are grouped in an orderly scientific manner (the elephant folio edition was unorganized, in comparison). Most subscribers bound their complete 500 plates and text in seven volumes. The first (royal) octavo edition prints do not have the lithographic backgrounds for the color tint on the same plates in the subsequent octavo editions. Except for this background change, all the octavo editions are the same. All the octavo editions are rare and desirable, and color plates still in good condition are hard to find. 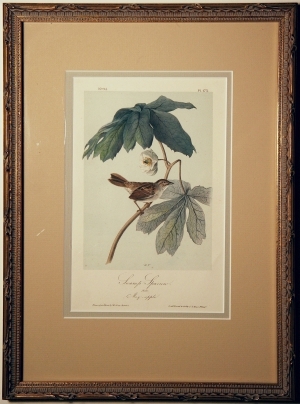 Many bird lovers seek individual species to mount and frame, created specific scarcities and driving up prices for selected prints.